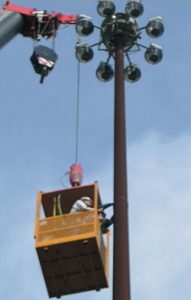 The objective of this research was to collect long-term behavior information on the performance of one of the eight high-mast lighting towers in the I-35/US 18 interchange near Clear Lake, Iowa for the purpose of validating assumptions made by others in an analytical investigation of these and similar towers. The research consist of three primary tasks. Task 1 was to design the long-term monitoring system needed to collect the required information. This system includee strain sensors, vibration sensors, wind speed sensors, and video recording equipment. The system was designed such that data can be collected and transmitted remotely to all interested parties. Task 2 was to install and maintain the above system for a year. Task 3 was to determine the natural frequencies and damping characteristics of about nine towers. This was accomplished by installing a sensor on the towers and then vibrating the pole manually. Working on the high mast tower.